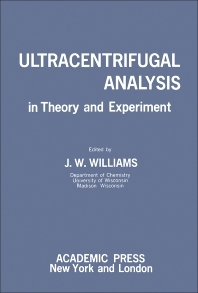 Ultracentrifugal Analysis: In Theory and Experiment aims to tackle some outstanding problems in sedimentation analysis. The book presents topics such as the thermodynamics of diffusion and sedimentation; diffusion and sedimentation in multicomponent systems; and the frictional formalism in the flow equations of sedimentation. The text also includes topics such as solutions of the general differential equation for the ultracentrifuge; the interpolation diagram for calculating model Schlieren patterns for reversibly interacting systems; and sedimentation of reversibly aggregating substances. Articles on the effects of charge on the sedimentation, the diffusion and the sedimentation equilibrium of colloidal electrolytes; the basic equilibrium equations; and the sedimentation equilibrium in reacting systems are also considered. The book further tackles articles on the optical systems for sedimentation analysis; computational methods of ultracentrifugation; separation cells; and the magnetic bearing for an ultracentrifuge. Chemists, physicists, and biologists will find the book invaluable.